1. Is the warm weather finally here to stay? I hope so because Samantha’s glamorous resort-inspired look on her blog Could I Have That? is making me crave summer more than ever. 3. 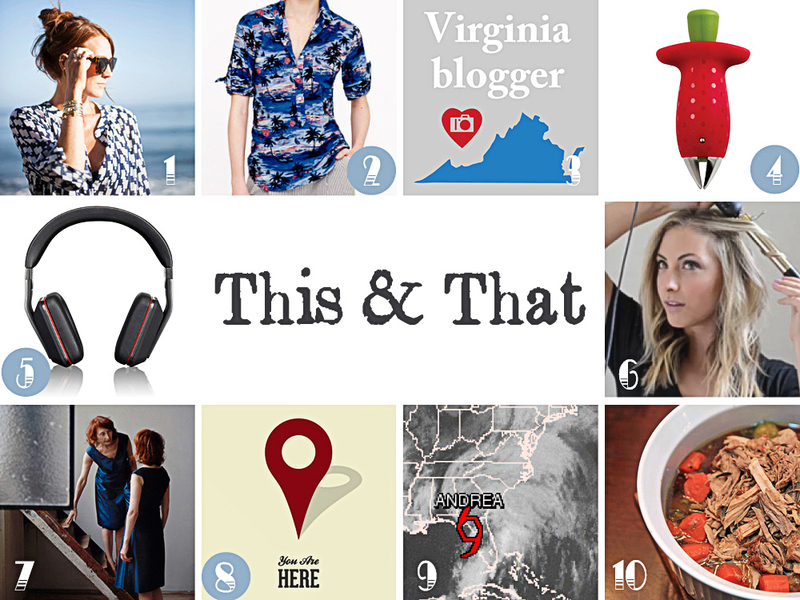 One of my new year’s resolutions was to find ways to connect with other bloggers, so when I discovered the Virginia Bloggers community the other day, becoming a member was a no brainer. Looking forward to finding ways to network with this group. 4. I used one of these strawberry stem removers at my parents’ house last week. Brilliant. About to order one for myself as soon as I publish this post. 5. After being out of the office for a full nine days, I was relying on my noise-cancelling headphones to help me hunker down and get caught up at work this week. Unfortunately, they’re getting on in years and starting to fail me. Time for a new pair? 6. Emily’s new beachy waves tutorial was the first thing I saw when I woke up Tuesday morning, so I had to give it a try. I polished mine off with a little Bumble & bumble Surf Spray, and my wavy ‘do saw me all the way through to Wednesday night. 7. This collection of photos about an inseparable pair of twins who lead an identical life made me smile. 9. Looks like more rain for the next 24-48 hours as Tropical Storm Andrea makes her way northeast up the coast. 10. Getting a little bored with my gluten-free diet (yes, I’m still at it), so I’m looking forward to giving this recipe a try over the weekend. Just a few links from around the web that caught my eye this week. How about you? Find anything interesting online recently? Share a cool link in the comments!